Hello there - there is so much going on at our house that we can barely keep up with it. The day before Trent was born I graduated from Miss Kelly's Young 2's Preschool. I needed that educational background to help me cope with all this craziness! 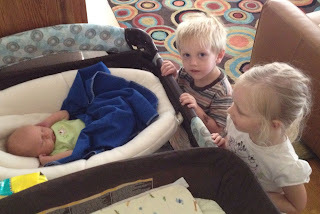 I'm not sure how I feel about being a big bro yet. It has been great having more of Dad's attention, but I'm frustrated that Mom doesn't have a lot of time for me now. I'm struggling with expressing my feelings to her. I've told her she could go back to work or go hide. Maybe then things would be more normal! Sometimes I push her away to test her; I need to know she still loves me. Trent doesn't do much, but at least he is harmless so far. I like to touch his head. One of our neighbors, Cannon, cuts our lawn. I think he's pretty old, like 16 or something. 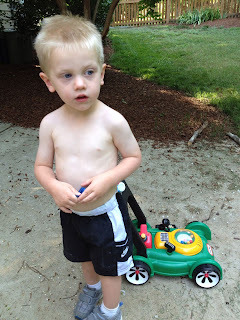 He always takes his shirt off when he is mowing, so now when I cut the lawn, I know I need to take off my shirt too, just like Cannon. I asked to be moved into a big boy bed. Today Dad went and got me a mattress. I also told Dad he could take down my crib. That was fun because I got to help Dad with the screwdriver. Hah-hah --- there's nothing like a preschooler transitioning into a big boy bed and a newborn in the house to cause sleep deprivation for the parents! I'm too tired to write much today. I am too busy eating and growing. I weighed 8 lb 15 oz at birth and 4 days later I was already up to 9 lb 4 oz. I picked up an eye infection at the hospital so now Mom and Dad are torturing me with eye drops four times a day. I just want to be left alone! One thing I hate is when I want to eat and Mom insists on changing my diaper first! On Wednesday Mom and Dad took me to some lady's house for pictures. The lady does Pilates at the same place Mom goes. It was really nice there. It was warm and she played lots of white noise. It was like going to a spa. Then they had Alden come and take some pictures with me. I feel like a celebrity! 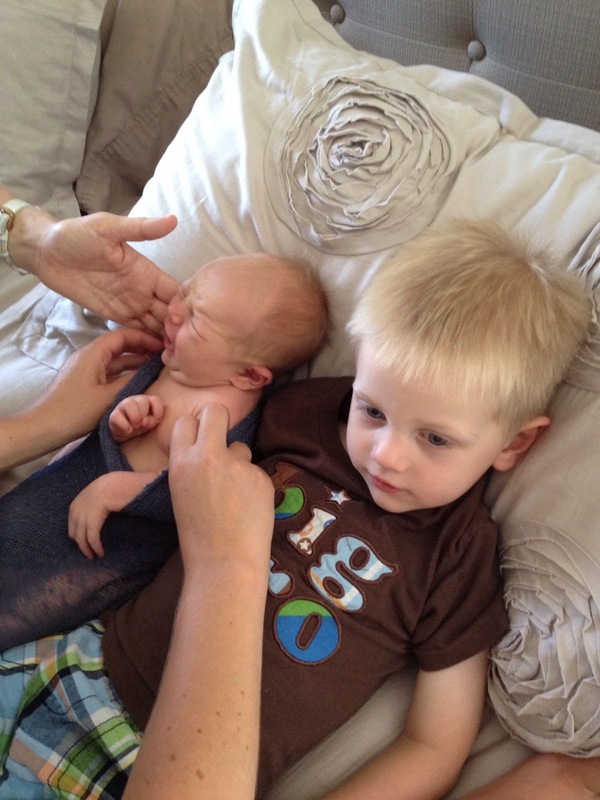 Alden introducing Trent to his friend Paige. Mowing the lawn just like Cannon! Taking pictures of Big and Little Bro.